When the young Pablo Picasso first arrived in Paris in 1900, the most progressive young artists all lived and worked in the seedy hillside quarter of Montmartre, in the shade of the old windmills. Over the next decade, among the studios, salons, cafés, dance halls, and galleries of Montmartre, the young Spaniard joined the likes of Henri Matisse, André Derain, Maurice de Vlaminck, Georges Braque, Amedeo Modigliani, Constantin Brancusi, Gertrude Stein, and many more in revolutionizing artistic expression. Blending exceptional scholarship with graceful prose, Sue Roe paints a remarkable group portrait of the men and women who profoundly changed the arts of painting, sculpture, dance, music, literature, and fashion. She describes the origins of such movements as Fauvism, Cubism, and Futurism, and reconstructs the stories behind immortal paintings by Picasso and Matisse. She shows how daily life in Montmartre—which brought artists together with acrobats and dancers, prostitutes and clowns—provided an essential cauldron for artistic experimentation and for the colorful relationships, friendships, loyalties, and feuds that gave rise to some of the most pathbreaking and lasting works of the twentieth century. In Montmartre is a thrilling account of an extraordinary group of artists on the cusp of fame and immortality that brings vividly to life one of the key moments in the history of modern art. 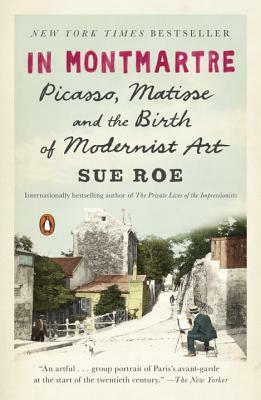 Sue Roe is the author of several books, including a New York Times bestselling collective biography of the Impressionists and a widely praised work on the artist Gwen John. She lives in Brighton, England. "Lively and engaging…. [Readers] will find a fresh sense of how all these people—the geniuses and the hangers-on, the wealthy collectors and the unworldly painters—related to each other…..In [Roe’s] entertaining, ingeniously structured account Roe brings Montmatre’s hedyday back to life." "With evocative imagery Roe sketches out the intensely visual spectacle on which Montmatre’s artistic community was able to draw…. Roe is particularly good at communicating the extraordinary devotion of Matisse and Picasso to their work." "What an eye for art Roe has ... we're still gripped by the story of the dialogue between Picasso and Matisse ... and by this book's own brilliant dance." "As an elegant synthesis of complex material, it excels : Roe is a skilled and graceful writer, capable of an accessible, nimble narrative .... In an important sense ... this book is timely ... it is a quintessential biography of the Facebook era, since its real subject is a social network." "Sue Roe has written a portrait in words of an era."